I love this time of year when fresh vegetables and fruit are overflowing from people's gardens! Sometimes we visit my father in law's and he gives us SO much stuff from his garden that I start to feel a bit overwhelmed trying to come up with ways to use it all up before it goes bad. But, most of the time, I love coming up with new ways to enjoy the plethora of fresh produce we are lucky to have available to us. Green beans are a favorite vegetable of mine. I love them just cooked up with a bit of butter and salt. Honestly, I don't often do too many "creative" things with them. I like them the way they are (or in five bean salad). I decided to dress them up a bit with these cute baby red potatoes in a tangy dressing of Dijon mustard, fresh lemon juice, and olive oil. We enjoyed this salad with a ham steak and some applesauce we canned last fall. It was a lovely late-summer meal. The recipe will serve about 4 people as a side dish. Bring a large pot of salted water to a boil. Blanch the green beans for about 45-60 seconds. Remove from the water with a spider/slotted spoon and run under cold water to cool slightly. Set aside. Add the potatoes to the same pot of boiling water and cook until fork tender. Remove and set aside to cool slightly. While the potatoes cook, cut the beans into about 2-inch pieces. Cut the potatoes in half. In a large bowl whisk together to mustard and lemon juice. Slowly whisk in the olive oil until combined. Add a couple pinches of salt and a few grinds of black pepper. Gently stir the beans, potatoes, onions, and parsley into the bowl with the dressing. Taste and season with salt and pepper, as needed. this looks like a fabulous salad! i love finding new ways to use up lots of summer produce. :) yum! Oh, this sounds great! I don't eat a ton of potato salads because I'm not a huge mayonnaise fan, but mustard version like this is right up my alley. Looks and sounds perfect! This is a fantastic salad, Amy. What a great combo of flavor! And I love the mustard you've added to the mix. This is my kind of salad -- thanks so much. 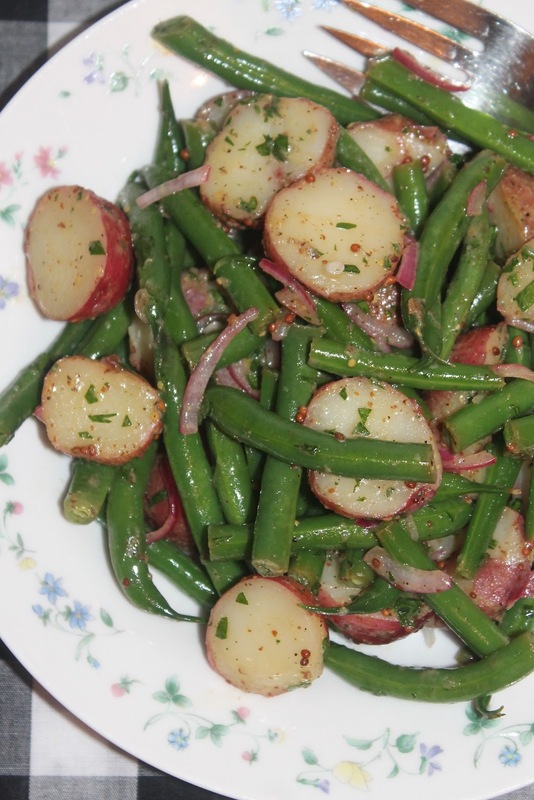 I've always loved mixing green beans into my potato salad! Such a great pairing. beans and taters will be one if my favorite pairings until the day i die, and that's definitely the influence of my fantastic grandparents. looks incredible! This sounds like a side dish that would make both me and B.O.B. Bob happy...he loves green beans and I love potatoes. Definitely going to give this one a try! This looks like a great salad and I like the vinaigrette instead of a creamy dressing. Green beans are my FAVORITE! This looks like such a yummy side for any cookout!